Since 1942, coin dealers have used the annual Handbook of United States Coins- the OFFICIAL BLUE BOOK- to make buying offers. You can use it to find out how much your coins are worth! 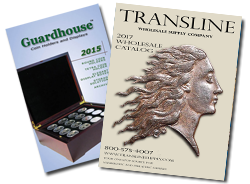 The Blue Book's prices listings offer a real-world look at the coin market, gathered from dealers around the country. The new 74th edition has been expanded, with eight additional pages of content including updated prices, new sections, and many new photographs. Coverage includes colonial and early American coins, federal coins (half cents through gold double eagles), commemoratives, Proof sets, die varieties, private and territorial gold, tokens, the newest Presidential dollars, National Park quarters, bullion coins, and much more. More than 24,000 prices in multiple grades. Easy-to-follow coin-grading instructions. Coins and tokens from the 1600s to today. With much historical infromation. Hundreds of detailed, actual-size photos. How to start a coin collection. Detailed mintage records, and much more. Place your Blue Book Pre-Order on a separate order from you regular stocking orders. Free shipping and discount pricing apply to case quantities only. Blue Book orders ship around the first week of May. *Blue Book Pre-Orders do not contribute to the $300 free shipping threshold for regular stocking orders. If Pre-Orders are combined with non-Blue Book items, your order will be split, and shipping will be applied to your stocking order if it is under the $300 free shipping minimum.